Posted on August 2, 2016 by Barry V.
Allens Pond Wildlife Sanctuary is a big, sprawling property with seven miles of trails and three separate entry points. Most visitors park at the Field Station entrance, with its proximity to Little Beach, and previous to my current residency project, this was the only section I had explored. Desiring to see these other areas, I started my visit at Stone Barn Farm. 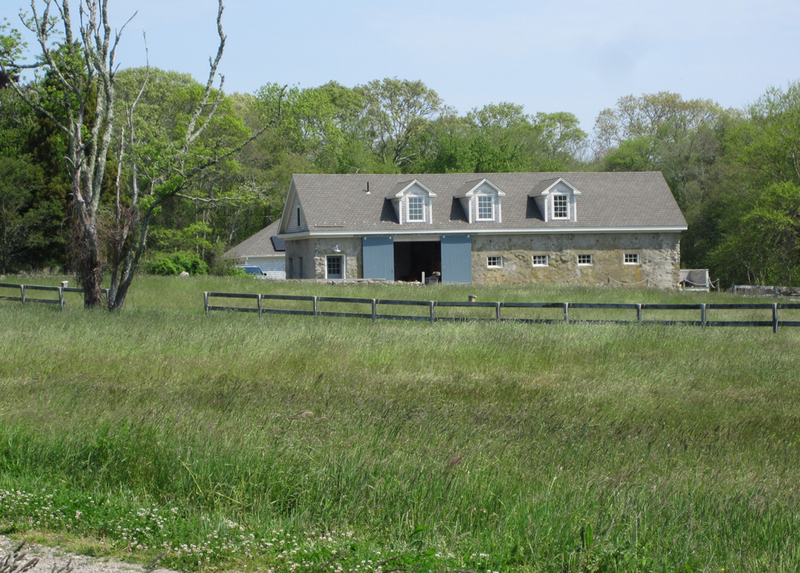 The historic barn has been beautifully restored and renovated, and this will be the site of the future Mass Audubon Allens Pond Visitor Center. It’s a handsome structure, and the architects have been careful to retain the original lines and proportions. 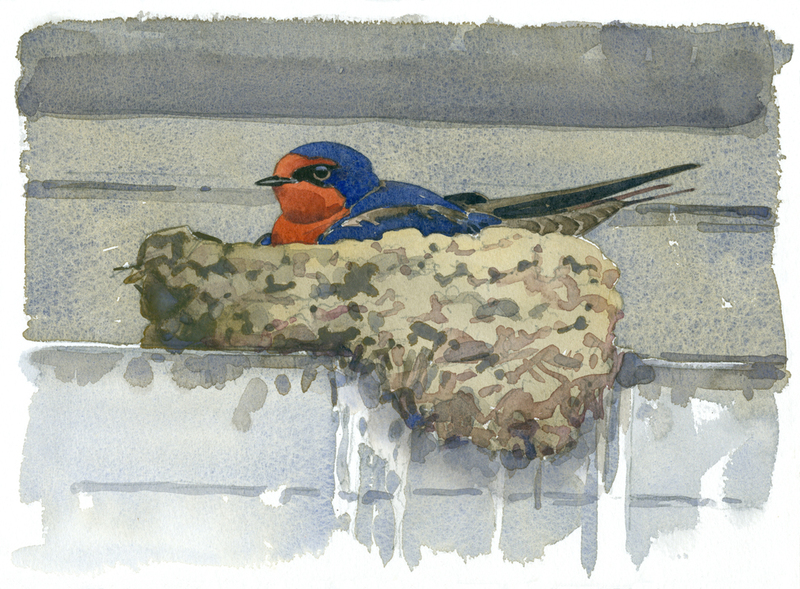 A barn swallow pair has built a nest on a ledge over the big sliding door of the barn, and while I’m there the bird sits quietly – a good model for sketching! The Quansett Trail leads through open fields, then coastal woods before intersecting with the Reuben’s Point Trail. 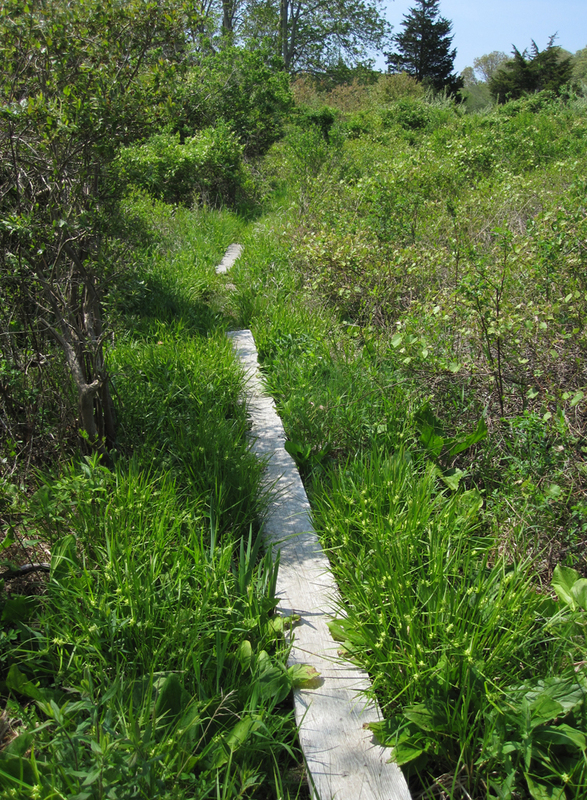 Closer to the Point, a simple boardwalk passes through a rich coastal wetland. I linger here to examine the interesting wildflowers and sedges. 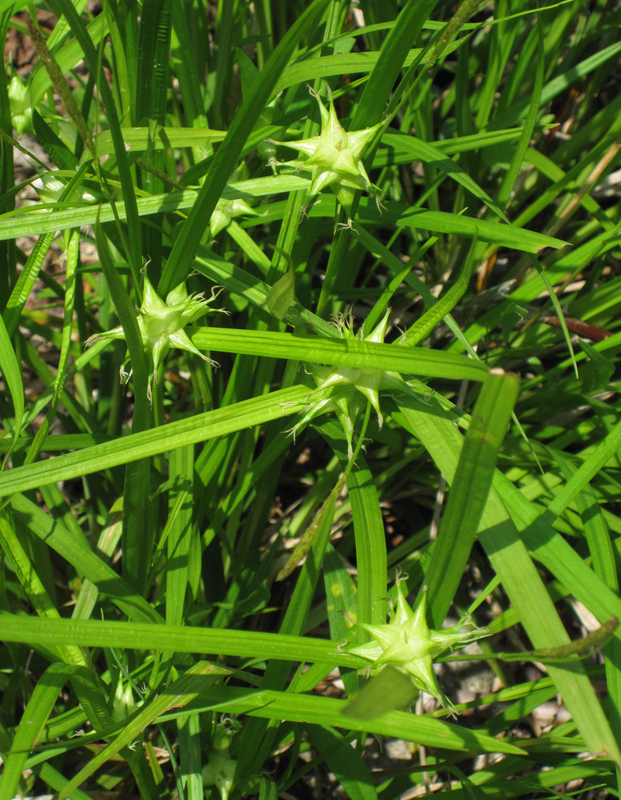 One species of sedge is particularly striking, with flower clusters that look like medieval battlefield weapons! Joe Choiniere helps me to identify it as Bladder Sedge (Carex intumescens). The trail rises onto a rocky outcrop as you near Reuben’s Point, affording a splendid view of the upper reaches of Allens Pond and Barney’s Joy. It’s a good place to set up for some landscape painting. 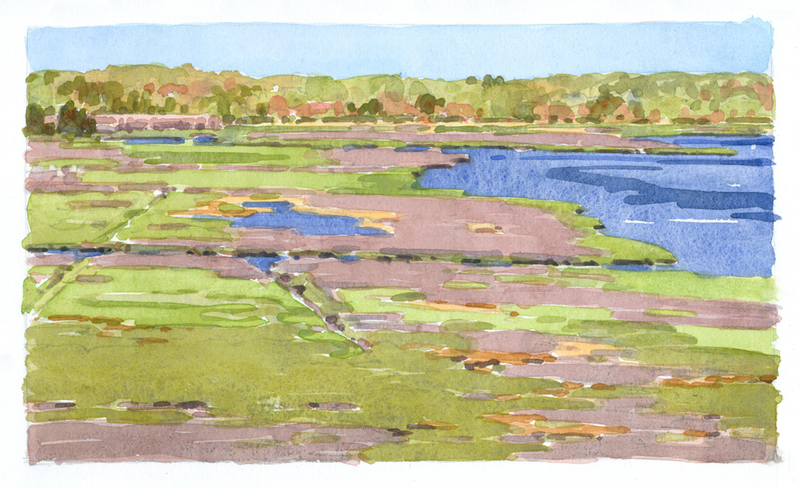 The pastel hues of Spring still predominate in the distant woods, and the marsh displays a rich mosaic of color. I’m surrounded on three sides by coastal scrub: dense thickets of shrubs and low trees that are home to a variety of birds. Catbirds and yellow warblers are abundant, but an unfamiliar song captures my attention. It’s a loud, persistent song starting and ending with a sharp chip. I jot it down in my sketchbook thus: “chip-che-wheeyou-chip!” For forty-five minutes I stare intently into the thickets, trying to pinpoint just where that song is coming from. Persistence finally pays off when the bird moves to a higher perch in a small cherry tree, and I have a clear view of a white-eyed vireo. Only later do I read that these birds usually sing from a low, concealed perch! I make careful notes on color and plumage and map out with my pencil the characteristic shapes and proportions of the bird. 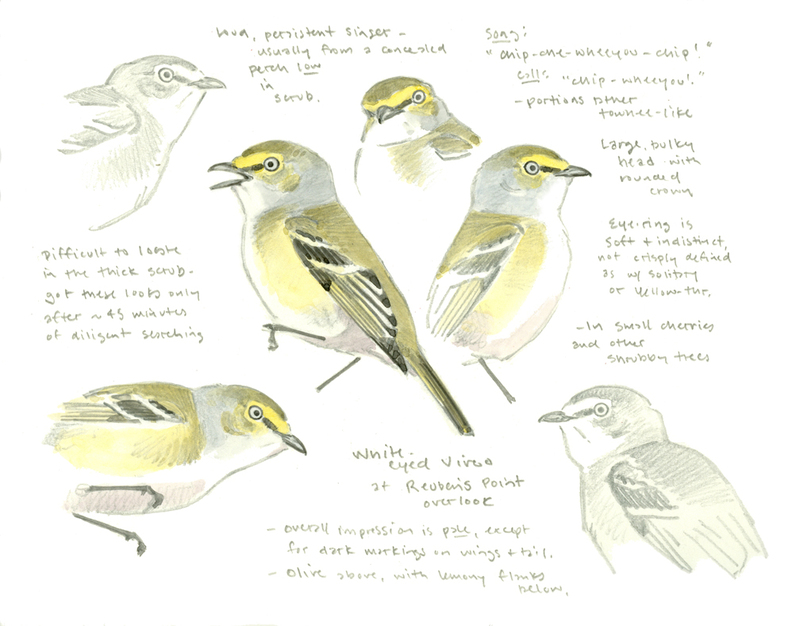 I have seen white-eyed vireos a few times before in Massachusetts, but never in a breeding situation. My observations at Reuben’s Point fill in the gaps of my mental picture of this lovely vireo, and afford me a better understanding and appreciation of its life history and biology. 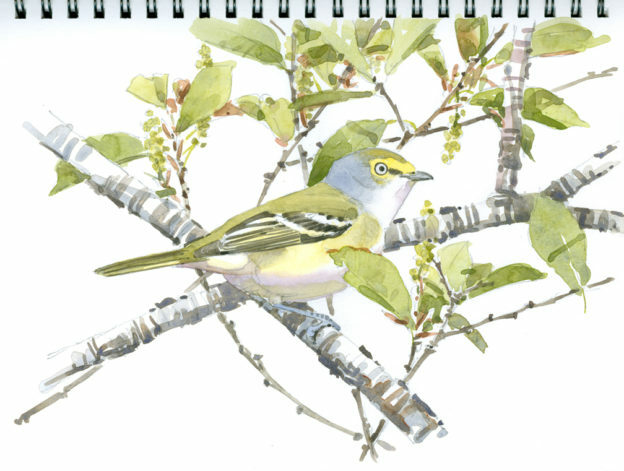 This entry was posted in Artists, Barry Van Dusen Residency, News and tagged Allen's pond wildlife sanctuary, Artist in Residence, Barn swallow, Barry Van Dusen, Bladder Sedge, field painting, field sketching, Mass Audubon, Rueben's point, Stone Barn Farm, Watercolor, White-eyed vireo on August 2, 2016 by Barry V..